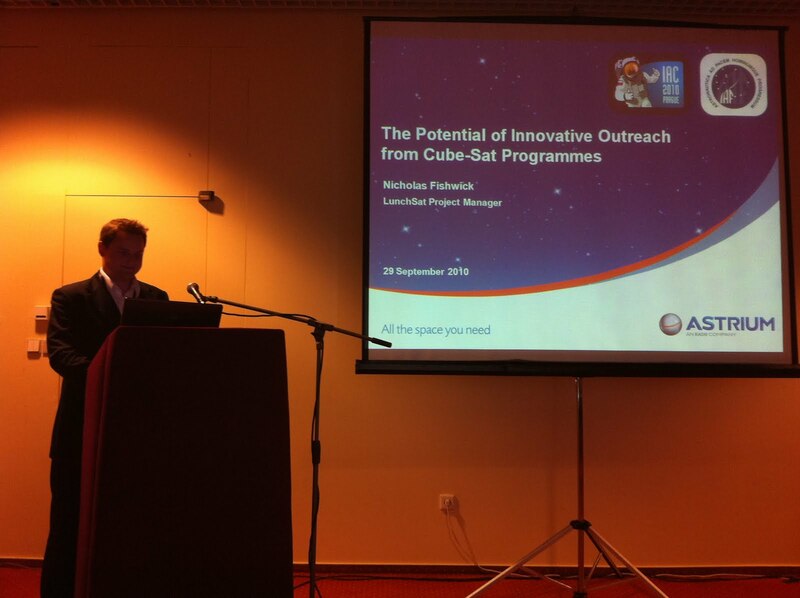 Members of the Lunchsat team have presented their papers to the global space community at the 61st International Astronautical Congress 2010 in Prague. Representing the Lunchsat project and Astrium, project lead Nick Fishwick and Tom Stuttard who were chosen to present their papers at the IAC in Prague, met in the heart of the Czech captial on a mission to spread the word of LunchSat to enthusiastic students, young professionals and industry veterans alike. The International Astronautical Congress (IAC) is one of the most established and attended space conferences in the world. This year, 3,500 attendees (including 283 young professionals) presented 1,600 papers at the Prague Congress Centre, where 300 exhibitors manned 50 stands across an exhibition space of some 1250 square metres in area, representing agencies and institutions including NASA, JAXA and the European Space Agency. The exhibition areas fostered networking with like-minded professionals, as delegates were encouraged to explore the stands between events. 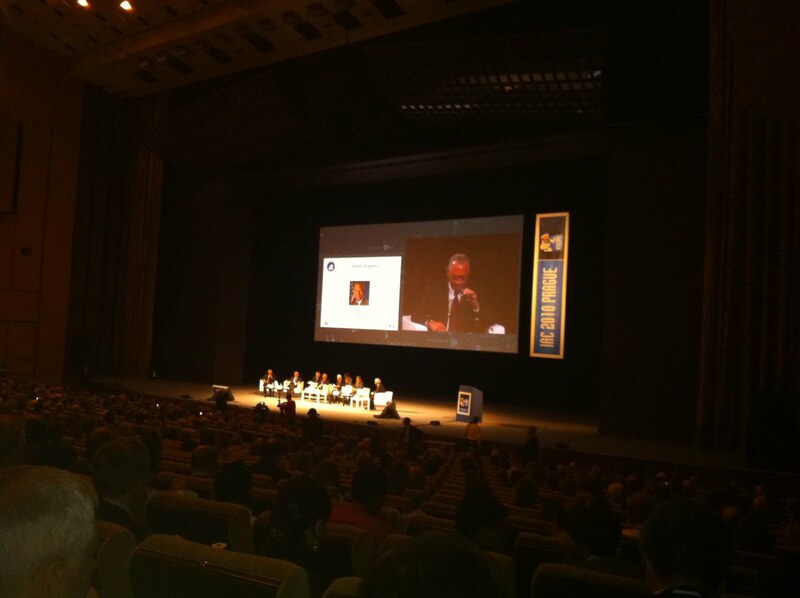 The festivities began on Monday with the official opening ceremony of IAC 2010 and a welcome to Prague and the Congress from Jan Kolář, Chairman of the Local Organising Committee and Berndt Feuerbacher, President of the International Astronautical Federation (IAF). The ceremony was a spectacular introduction to Czech culture, featuring children dancing in traditional dress, dancers and violinists, technicolour artists unleashing their creative talent upon an unsuspecting auditorium of space enthusiasts that quickly warmed to such a vibrant cultural performance. The event was set upon a backdrop of photographs showcasing Prague and a variety of venues from across the Czech Republic. A range of plenary sessions focused on contemporary themes pertinent to current space exploration and introduced several key figureheads of the global space effort. The Congress began on Monday with a Heads of Agency plenary whereby the American, European, Indian and Japanese space agency heads provided an overview of their current programmes and insight into future plans, followed by an interactive discussion with the audience. The next plenary, The Impact of Governments’ Space Policy Changes on Industry, brought agency and industry heads together. Two events on the public programme discussed global navigation systems. One plenary, Never Lost Again, demonstrated the worldwide importance of satellite navigation systems to the public, to industry, transportation and to the military. A highlight lecture on the same subject area looked at the origins, surprises and future of GPS. The Global Sea Level Rise and Its Societal Impacts plenary examined different aspects of sea level rise including current international spaceborne programmes that make sustained, precision measurements of the phenomenon. The Advancing the Global Exploration Strategy plenary talked about the International Space Exploration Coordination Group (ISECG), where agencies have expressed their intent and determination to work together to enable the exploration of the Moon, Mars and asteroids. A further plenary, ISS Research – A Decade of Progress and a Decade of Promise discussed research taking place on the International Space Station. SETI Progress and Prospects looked at the continuing search for extraterrestrial intelligence, with the final highlight lecture entitled Chandrayaan-1 and Water on the Moon. There were three Late Breaking News sessions discussing Rosetta, Hayabusa, Falcon 9 and ECAPS. The second day back in the exhibition space introduced the first nanosatellite fair held by the IAF at an IAC event, with 30 representatives from the nano-satellite industry presenting their commercial products and concepts. Free launch opportunities were also discussed, and we took the opportunity to explore the potential options available to us for when we plan to launch Lunchsat from 2011. 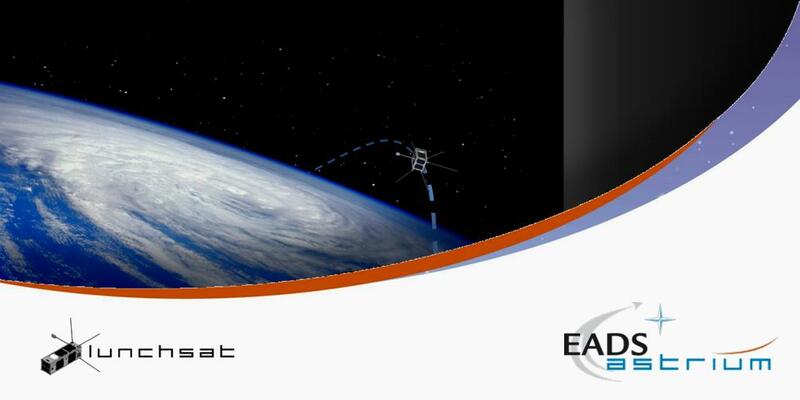 One notable project was QB50, a research project to investigate the potential for distributed computing and in-situ measurement of the space environment across 50 nanosats in low-Earth orbit. For more details on this project and others that were presented throughout the session, consult the Nanosatellite Fair pages of the IAF. Nick's paper, 'LunchSat: A Training Programme for Young Professionals in EADS Astrium to Build a Nano-Satellite', introduced the project to the Space Education and Outreach Symposium and was the first to be presented of the three (see details). The second paper, 'The Potential of Innovative Outreach from Cube-Sat Programmes', followed on Wednesday for the same symposium and provided an insight into how educational projects such as Lunchsat can be used to highlight the effectiveness of outreach initiatives to benefit institutions and the general public (details). Tom's technical paper, 'Systems Engineering, Operations and Payload Interfacing in Cube-Sats', followed on the final day and was presented to the Small Satellite Missions Symposium (details). Once the papers were presented and our networking events attended, we had just enough time to explore the rest of Prague -- a beautiful city with many cultural attractions and some interesting historical connections to astronomy, making it a fitting venue for the Congress. One particularly noteworthy attraction was the Prague Astronomical Clock, a medieval tower situated in the Old Town Hall featuring a dial representing the relative positions of the Sun and Moon in the sky. Crossing the famous Charles Bridge across the Vltava, we also visited Týn Church and Prague Castle. Gaining altitude, we reached the summit of Petřín Hill and enjoyed stunning views of Prague in all directions from the top of the Petřín Observation Tower. Nearby was a local gem not to be overlooked -- Štefánik's Observatory, founded in 1928 and named after Slovak astronomer Milan Rastislav Štefánik. The main telescope of the observatory is a double refractor by Zeiss, placed in the main dome by Viennese selenographer König. A mirror was installed in the western dome in 1976, with the eastern dome used for scientific observations. 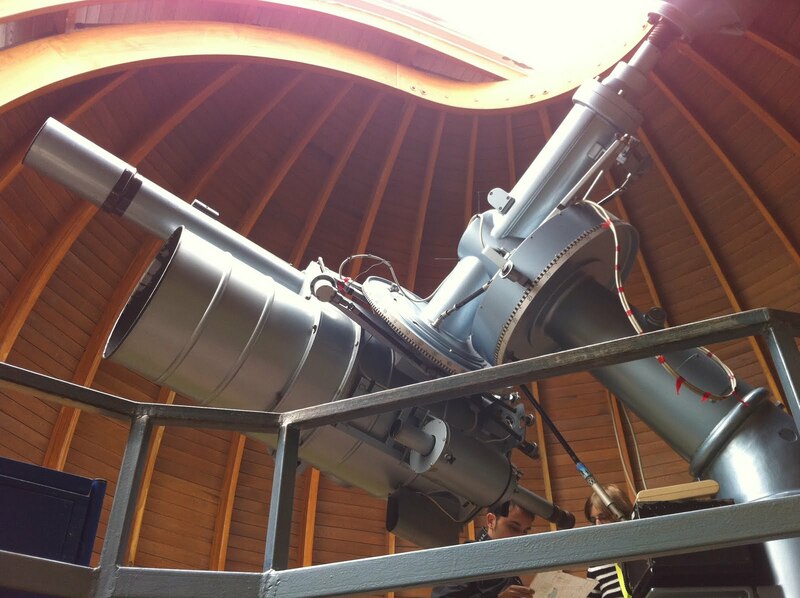 Since 1999, the observatory has been equipped with a 40cm mirror telescope by Meade. Thankfully, the weather stayed dry despite being overcast with rain consistently forecast for the week. Although our time was over before we knew it, we returned proud in the knowledge that we had contributed to one of the most prestigious space conferences in the world. We would like to thank the Lunchsat team for their ongoing efforts, our colleagues, followers and enthusiasts for their support, and Astrium for providing such an incredible opportunity. Videos of the plenaries, lectures and news sessions as part of the IAC 2010 Public Programme can be viewed on the IAC 2010 website. Presentations of other nano-satellite projects featured at the Congress can be downloaded from the webpages of the Nanosatellite Fair. The next Congress will be held in Cape Town on 3-7 October 2011. For details, to apply and to submit an abstract, see the website for the next IAC 2011 and the Call for Papers. The IAC is hosted annually by the International Astronautical Federation, 'connecting space people'. For more information, visit the IAF website.